The cost of low trust between employees and leaders, and consumers and business is staggering, according to a host of studies by Gallup, Forbes, Washington Post, Maritz, MasteryWorks, The Economist, Edelman, and more. On the other hand, the value of high trust between these same groups of people is significant. Trust is one of the most important elements that affect how people work together and build relationships that contribute in a positive way to the family, community, or workplace. According to Pat Lencioni, the best selling author of Five Dysfunctions of a Team, lack of trust is the most critical factor in why teams fail to perform effectively. So how does one build (or rebuild) trust with others? From my many years of experience, trusted relationships between people is based – more than anything else – on an individual’s character. When I ask others the question: “Who were the most influential people in their lives?” the responses I overwhelmingly receive are family members, coaches, and teachers – people they trusted. Most often they are people who were marvelous examples of character – people worth emulating. How about you? Have you ever worked in an environment or been part of a group where you did not trust the leadership or your teammates? How did that make you feel? How did that affect your attitude and commitment to the organization or group? How differently did you feel when you were associated with people you did trust? To me, the most important element of being a successful leader is being a leader of character. It represents the sum total of who we are as individuals, what is in our hearts and souls. Character serves as the foundation for our behavior, how we live our lives, the environment we create for our homes and places of work, how we interact with others. The opportunity to lead people is such an enormous responsibility and honor – you want to be the very best you can be. 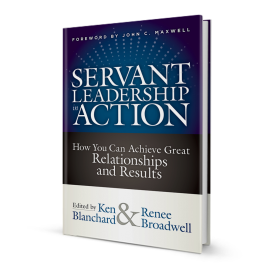 It is rare in today’s world to pick up any best-selling leadership book and not find “character” somewhere in the opening chapters. There is a reason for that – experts agree on its importance to effective leadership. Unlike the leadership skills we see in others, evidenced through their behavior, character cannot be seen by simple observation. It takes concerted effort over time to demonstrate that you understand it and that you live it. Character begins taking shape in our youth. Parents, siblings, relatives, teachers, coaches, Scout leaders, pastors, priests, rabbis and Sunday school teachers all are influencers. As we age the influencers expand to include bosses and colleagues at work, elected officials, historical figures, friends, children, and the list goes on. Being a leader of character is a life-long process. Leaders of character have the moral courage to stand up for causes they believe in. They exhibit behavior that enables others to trust them, for they know without trust, the team will fail. They are honest with their people and do what they say they are going to do. They follow a code of ethics – those established rules of conduct that all are expected to obey. They have a passion for doing what is right and face the consequences of their actions. These leaders possess the inner strength to solicit and accept feedback in search of ways to improve as a leader. They are not afraid to admit mistakes. They understand the importance of gratitude and look for ways to show appreciation to others. They believe in loyalty – to themselves, their families, their work. They have the courage to hold themselves accountable for failures in their organization. They show that they have a heart through exercising humility and empathy. They show tough love when the situation calls for it. They are kind, respectful, and compassionate. They are committed to harvesting the gifts others have and are willing to overlook personality conflicts to help this cause. They underwrite honest mistakes by members of their teams in pursuit of excellence, affording opportunities for people to take prudent risks and grow as leaders. They do their very best; their sincerity is deep seated and profound. They are selfless in their service to others. They fully understand the importance of the mission, but they exercise the patience which gives others time to learn how to accomplish it. In short, they do not simply talk the talk – they walk it. They are role models. Of all the various dimensions of character that must be mastered by those who strive to build trusted relationships, integrity stands out as the most important. Integrity is that personal code of conduct derived from that individual set of principles developed over time from life experiences, which ultimately guides our behavior. It is that moral compass that enables you to make decisions to do what is right even in the most difficult of circumstances. It helps guide you and your actions when no one is looking. Your word is your bond. When people look into your eyes, what do they see? If they do not see a leader committed to living up to the standards established for all, then the seeds of distrust will be planted. You should be constantly looking for opportunities to demonstrate your commitment to integrity. Good values attract good people. Good values retain good people. Being a leader of character is not negotiable – it is that simple. 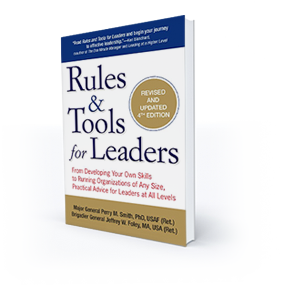 To read more, take a look at Rules and Tools for Leaders (2013, Smith and Foley).